Let’s award even more Champion Athletes With Diabetes. What does your medal look like? Hey, we all need a goal. Why not a medal that recognizes your hard work and determination in the face of a never-ending chronic condition? I have such a medal, and I would love to send it to you or a loved one living with diabetes. If it means that 5k run is completed, if tournaments or meets are finished, if someone checks in to their fitness class on a regular basis, it’s worthy of this medal and my congratulations. Send an e-mail to champswithdiabetes@gmail.com. Let me know what you or your special athlete is taking part in, or took part in. Tell me about the resilience it takes to live with diabetes and pursue athletic goals. Give me your address. And I’ll send you a medal! 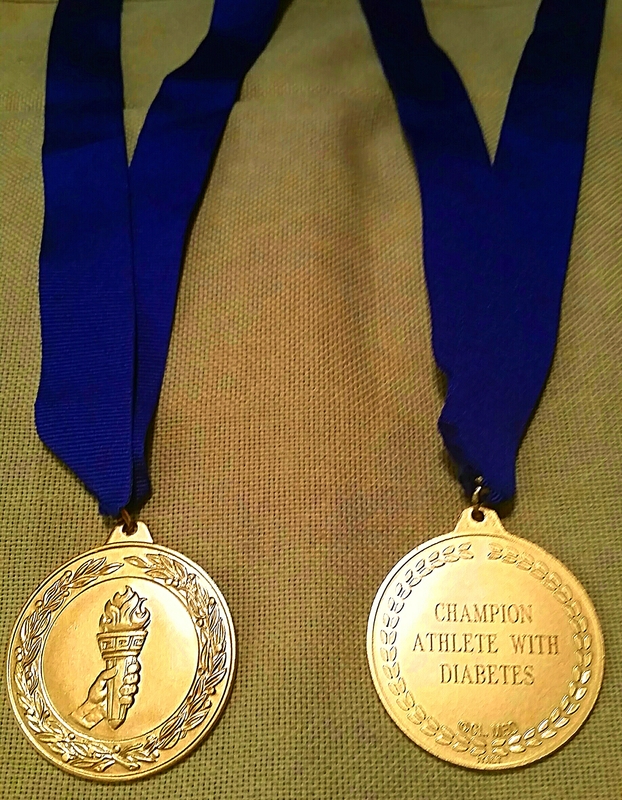 To date, over 80 Champion Athlete With Diabetes medals have been awarded to people on five continents. Trust me, it’s a cool medal. Our ranks have been growing every year, and I’d like to add you or your loved one to the roster. Send me your e-mail today, and let me say congratulations for a medal well earned! « 8 keys to my diabetes success. Stephen, when I get to skydive I will apply. This medal is the second part of weight loss effort.